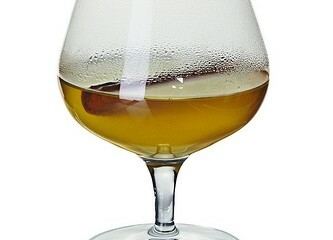 Pour hot water and creme de menthe into one brandy balloon and place the other brandy balloon on top. Add the berries and zests from the orange, lemon and lime to the second brandy balloon, followed by a bar spoon of sugar and the brandy. The first brandy balloon with hot water should help to heat the brandy a little making things easier to light. Take a little bit of brandy from the glass using a bar spoon and set fire to the brandy and bar spoon, then put the spoon into the glass and rotate the second brandy balloon. This should caramelise the sugar a little and bring out the flavours of the zest and berries – heat the mixture for 1 minute. 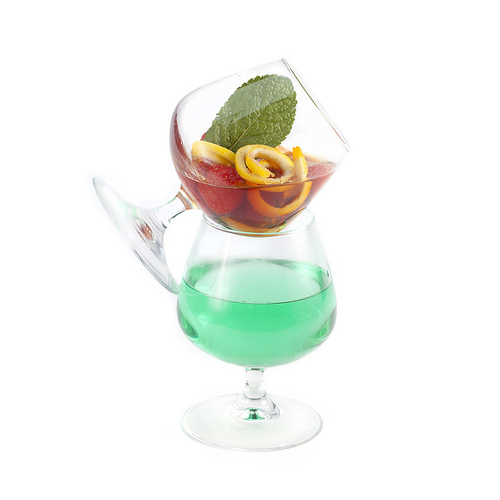 Put the flames out, then pour the contents of the first balloon away and por everything from the second into the first – this adding the flavour of the creme de menthe to the mix.